When I was a kid, Glen Campbell was at his prime. He had hit after hit, chiefly due to the great songwriting talent of Jimmy Webb and a voice that had various inflections and a cowboy strength. He was a pin up boy for country music long before it was fashionable to be a pin up boy for country music. He had a Hell of a personal life to match the pin-up image and part of that was self inflicted. There was something of the good old boy about him, despite the rumours and the truths and you couldn’t help but love him. When I was growing up, there were always Glen Campbell specials on tv and then the old Rhinestone Cowboy hit and well that was just all over the charts like a tsunami. Glen reinvented himself several times, but he always remained true to country music and he was always a cowboy. I always loved the words of Try a Little Kindness….it was the hippy child in me. It was also an easy song to play on the piano – the only thing other than Jingle Bells and Chopsticks that I can play on the piano, albeit very badly. 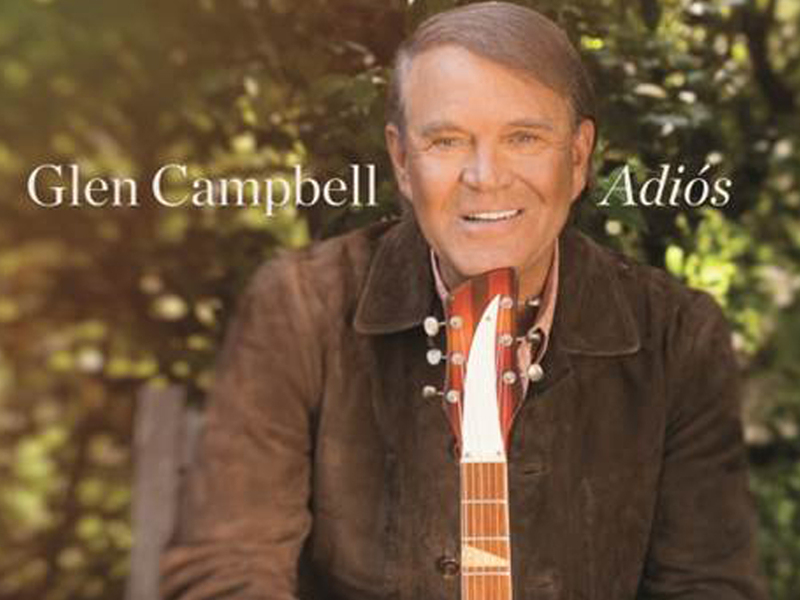 Glen Campbell’s music has endured. Who doesn’t love him singing Wichita Lineman or Galveston? Glen was even a Beach Boy at one time and if you look at him you can see how he could have fit in as a Wilson brother. Oh and then there are the harmonies! Adios is a fitting farewell for Glen Campbell, who has been saying goodbye in various ways since he was diagnosed with Alzheimer’s a few years ago. That is the nature of the disease. It can be quick in some cases and slow in others. It is probably one of the saddest ways of passing. This is Glen’s last studio album and a collection of his favourite songs, produced by Carl Jackson, who has been a longtime friend and colleague. What makes the title of this album triple in poignancy is that it is written by Jimmy Webb and it was originally recorded by Linda Ronstadt, who sadly, can sing no more on top of Glen’s last stand. Rolling Stone thought that some of the tracks were too sterile or too polished. If anybody at the famous magazine had any knowledge of what Alzheimer’s does to a person and their family and friends they may understand what a Herculean effort this is. On the previously unreleased Roger Miller song on this album, there is a rough intro recording from Roger which leads into the Glen/Vince version. If it doesn’t make you cry or at least mist over a bit, then you ain’t human. A lot of these songs will be familiar to you. Bob Dylan’s Don’t Think Twice, It’s All Right which has been sung by a lot of country music singers. Everybody’s Talkin’ – the Harry Nilsson song (written by Fred Neil) is there for the words – if you think about it, the shoe fits. That point was also lost in a lot of reviews that I read who slammed this version. ‘Everybody’s Talkin’ at me, I don’t hear the words they say….’. Arkansas Farmboy by Carl Jackson is a Glen Campbell biography. Who needs to read the book when you can hear the song? It is probably my favourite song on the album, though every song is pretty special. It is good to hear Willie on there with Glen, singing what will probably be a huge hit again for Willie, Funny How Time Slips Away. If you think of the words and the titles of these songs, they most definitely fit the story of Glen Campbell and a certain bittersweet album. The old George Jones song (I like Elvis singing it, too) – She Thinks I Still Care, is very much in the footsteps of George. You can almost hear him singing with Glen. These songs were recorded a few years ago when Glen had trouble remembering words but knew the melodies and his voice was still pure. Sadly, he doesn’t talk anymore, though strangely, he still sings but according to his wife, it is mainly gibberish. The days are numbered now, as he is in the final stage of a disease that I know way too much about. The beauty of being a great musician, writer, painter, actor is that your work lives on. You can just pop in a cd, go to an art gallery, watch a movie, read a book, see a play and there it is. We will forever remember Glen Campbell……long after his memory has gone. Hi gang, just in case you don’t know, you can still read the reviews and articles that I did on my old blog, just by hitting the link on the side here, A Country Hattitude, or you can google it. Also, I have been selected as the Australian rep at the moment for bluesandrootsradio.com blog Down Under Beats. It is just a summary of artists and events going on in Australia. This blog will keep on going – I have more in depth stuff to cover here, but the other ones are there if you want to check them out. If my family were to sing together professionally, we’d be hooked off the stage before we got on…save for my sister, perhaps. These guys sing together and sound like they enjoy it. There are a mixture of songs on here, I gather the A.Ree is Anita and not Averill, but I may be wrong on the originals. There are a few covers, but not always obvious ones. The family’s bond on album is obviously a reflection of their off the record relationship. They all complement each other and sound like a close knit group who love their music. It is more than a family singing in the lounge room or around a campfire. The band play pretty close to the originals in their arrangements. A very enjoyable album for a lazy afternoon. May you have many more happy years of singing together. Hot Up Here (A. Ree) – The catchy very Australian, very Queensland Summer song that has had a fair bit of airplay. Creepin’ In (Alexander) – Sung by the likes of Norah Jones and Dolly Parton, it doesn’t get more country than this. Hear ‘Em Go (Dixon) Unmistakeably a Slim Song. Trevor’s hand fits the glove on this one. Feels like home (Randy Newman) – One of my favourite songs from any genre, by one of my favourite songwriters. Like most of Randy’s songs it has been used in several films and tv shows and even a commercial. Chantal Kreviazuk made it a hit, singing it for the movie How to Lose a Guy in 10 days. Our own Melinda Schneider does a ripper of a version. This is the most country version that I have heard, complete with twangy guitars. Queen of hearts (H Devito) – Classic country song, and apparently one of Trev’s faves. I think that this is close to the best song on the album – great version guys. Love is the way (Kristofferson) – Kris Kristofferson is my favourite country music songwriter and I don’t know this song. It is great to learn one that you don’t know. Strangely, I have missed him LIVE. I have all of his cds and dvds and movies but I missed out on seeing him once when the tickets had to be cancelled due to him being ill. Another time, I shouted my folks to see the Highwaymen but couldn’t go myself. Nevermind. He’s a legend and this is a cool song. You can tell that it is a Kris song by the words. 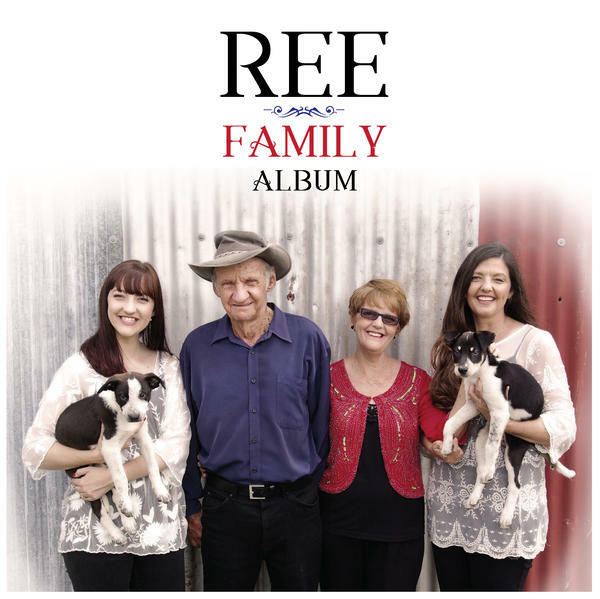 Dog or Two (A.Ree) – A very Slim Dusty like song…..sounds like Anne K may have had some influence here too. Maybe the Sunny Cowgirls could do back up vocals! Stars in my crown (E.E. Hewitt/John R Sweney) Traditional Hymn – Most country artists know how to sing a hymn or two. This one has been sung by many of the big stars, I was surprised not to hear this on Reba’s latest gospel album, though I have heard her sing it before. The guys sound very comfortable with the gospel style. Anna’s song (A. Ree) – Sad story behind this. They lost a family member very tragically at 17. This is a tribute to her. Lovely harmonies, a beautiful, heartfelt song. End of the Line (The Traveling Wilburys) – A hard song to do, because it was written and sung by not just one legend, but five. I think that it is one of those iconic songs that most people know and most people have sung along to at one stage or another. It is a good song for a family to sing.